So while I was home for part of my vacation, I decided to make use of our BBQ grill. My parents have a nice deck with a gas grill on it, but they never use it unless there's company over or I'm home. It was the middle of summer, and I just really wanted to get some grilling action in since I don't have easy access to one at school. The only issue is that my parents really don't like hamburgers and hot dogs haha, I guess it's just not something about not growing up here in America that makes it difficult for them to appreciate some of the common BBQ foods. So I created a more seafood geared menu, and tried to make it a healthy BBQ (unfortunately that meant no ribs). Cut up salmon filet into 1 inch wide strips (about 1 inch thick), leaving skin on if desired. Thread each strip onto a soaked bamboo skewer (soaking it helps prevent burning on the grill). In a bowl whisk together soy sauce, honey, vinegar, garlic, and pepper until well mixed. Marinate salmon skewers in mixture in a shallow casserole dish for 30 minutes at room temperature, turning to coat occasionally. 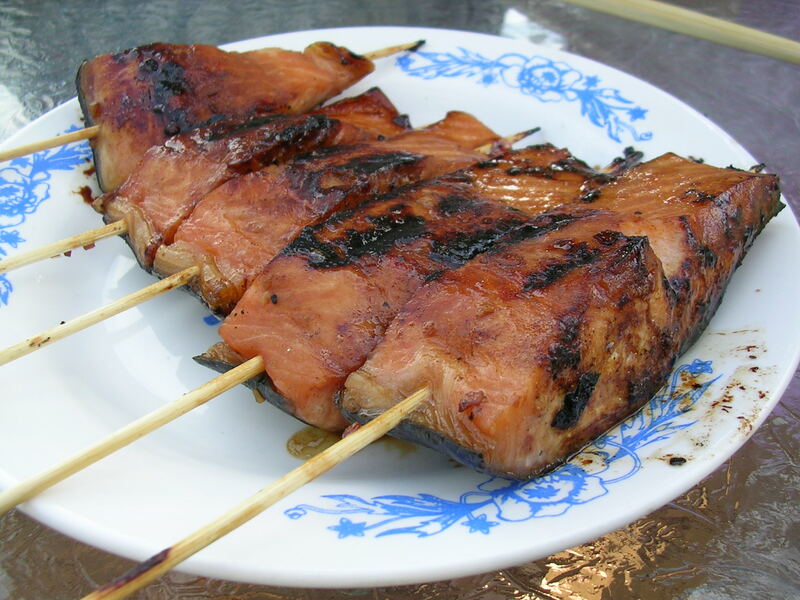 If you have skin on your salmon, marinate with the flesh side down to get the most flavor. When finished marinating, pour off excess marinade and simmer in a saucepan for several minutes. Save this sauce for brushing the salmon during grilling. Preheat grill for medium-high heat and place aluminum foil on the grate to help prevent the salmon from sticking to it and breaking off. Spray foil with oil and place salmon flesh side down on the grill. Cook about 4 minutes per side or until the fish is just flaking but not breaking apart when turning. Brush with saved sauce as desired during grilling. 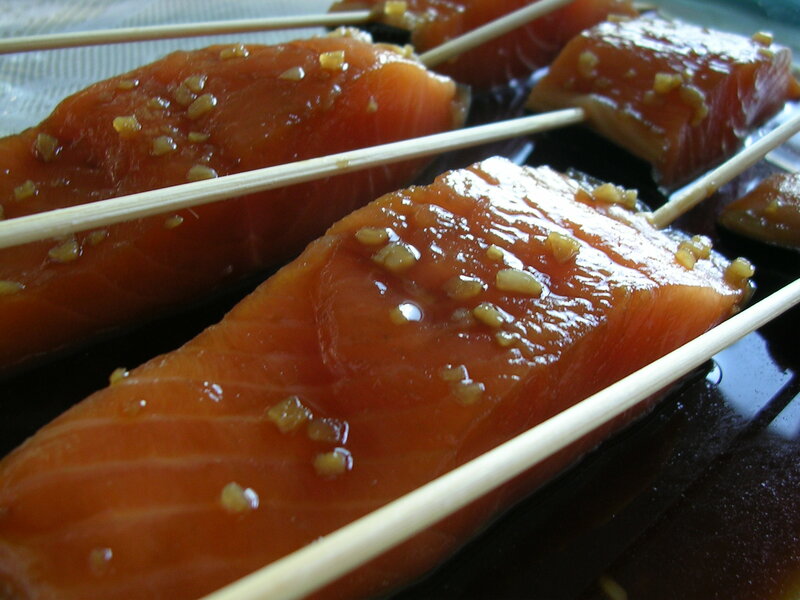 Turn salmon skewers carefully with tongs during grilling. 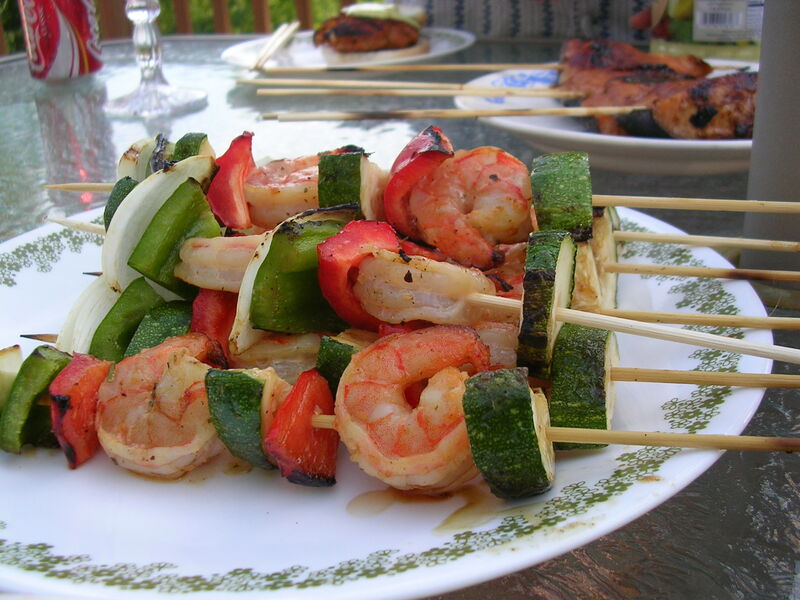 These shrimp kabobs were pretty easy to make. You can thread on any assortment of vegetables you have sitting around, as long as you like eating it. The important thing is to marinate the shrimp before grilling, which gives it enough flavor so that the whole kabob doesn't come out tasting bland and boring. I threw together a pretty random but successful marinade based on what I had available in my kitchen. Feel free to experiment! These are the approximate ingredients and you can vary the amount as desired, since I didn't do any specific measuring anyway. Mix together 1 tsp salt, sugar, white pepper, 1 tbsp herb seasoning (including onion powder, rosemary, thyme, garlic powder), 2 tbsp Hidden Valley ranch dressing, 1 tbsp olive oil. Coat peeled and deveined raw shrimp and marinate at room temperature for 30 minutes. 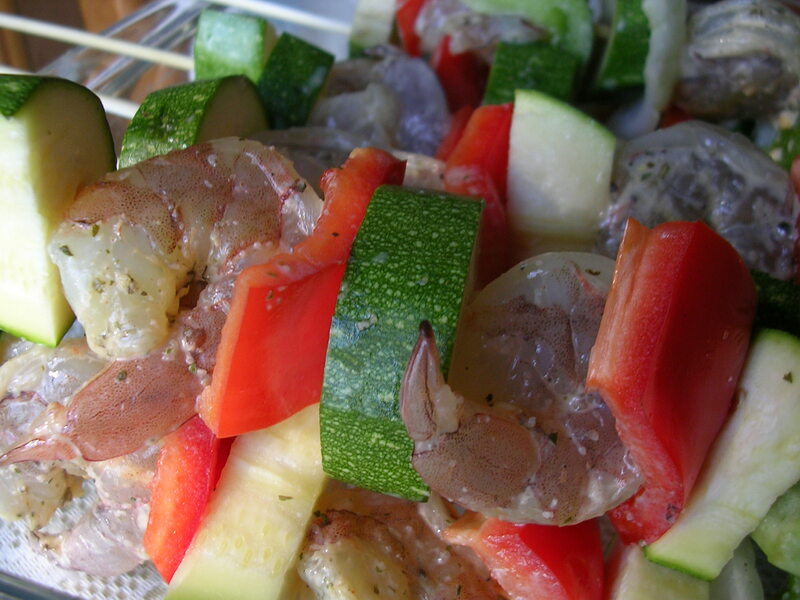 Thread shrimp onto kabobs alternating with fresh cut vegetables (above I used onions, red and green bell peppers, and zucchini). Grill on medium-high heat until shrimp is cooked through, they will become opaque and orange, and will curl up slightly. Turn every so often to get even grilling. Combine sauces above and stir into ground turkey. Stir in onions and carrots, mix well. Shape into 4 burger patties, they will be moist and floppy, so grill them over a foil-lined grill surface so they take shape as they cook. About 6 minutes on each side or until centers are cooked through. 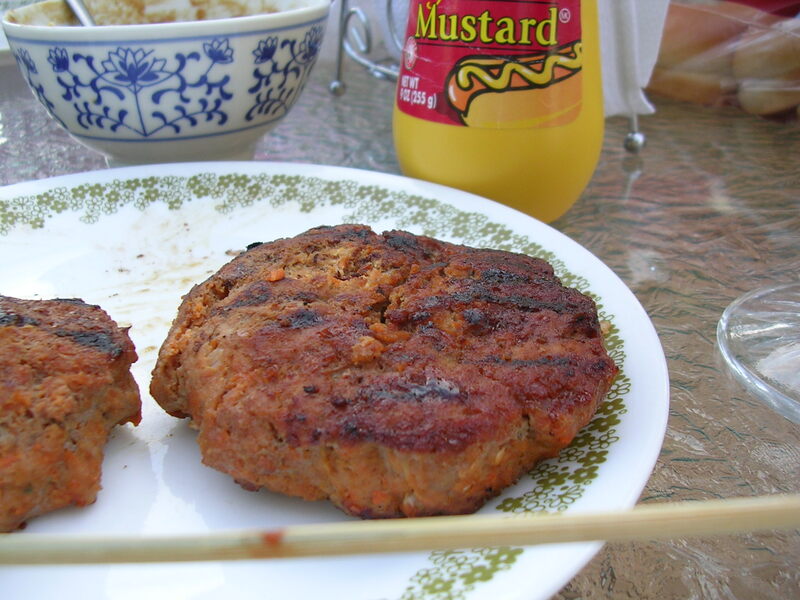 I really liked the turkey burgers because they were so flavorful from all the condiments in the meat! I learned the idea from a Weight Watchers recipe, which says that by flavoring the patties with condiments prior to grilling, you get extra flavor in the meat and don't even need condiments on top when you eat it. You can definitely taste the flavors from the sauces, I thought it was great. Plus it's so healthy too. These were a simple but tasty dessert after a bbq meal. They're a healthy and refreshing way to end the meal without much fuss. The directions are super simple: cut peaches into halves, remove pits. Spray flat side with cooking spray or brush with melted butter. Sprinkle with brown sugar on top. Grill on foil surface with flat side down until sugars melt and become bubbly. 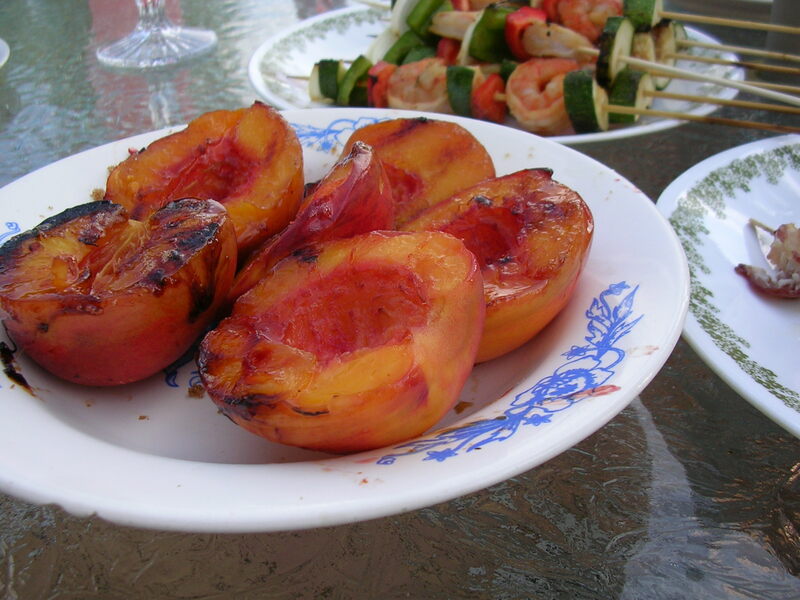 Continue grilling until peach is warmed up, let cool briefly and serve. Admittedly you don't get pretty grill marks on them when you cook them on foil, but I like the thought that all the sugars are staying in place instead of falling down into the bottom of the grill. When you grill them, the sugars in the peaches get caramelized on the surface, and together with the melted brown sugar it becomes a lovely glaze to go with the warm peach flesh. Tasty! As a side dish I also made some Vietnamese summer rolls for variety. They're pretty easy to make, and don't need to be heated up. Plus it was summer! Summer rolls in the summertime seemed just perfect to me :) All you need to do to make these is to get a packet of dried rice paper sheets for wrapping the rolls. They might say spring roll wrappers on them but make sure they are made from rice flour and look somewhat translucent (don't accidentally get the doughy spring roll wrappers used for fried spring rolls). Before starting, prepare some cut up lettuce, carrots, onions, and cilantro. Briefly boil some rice vermicelli and rinse in cold water. Let sit in a colander to drain. They should be opaque and soft but not mushy. Also cut up some thin slices of pork and shrimp, boil briefly to cook through and drain. 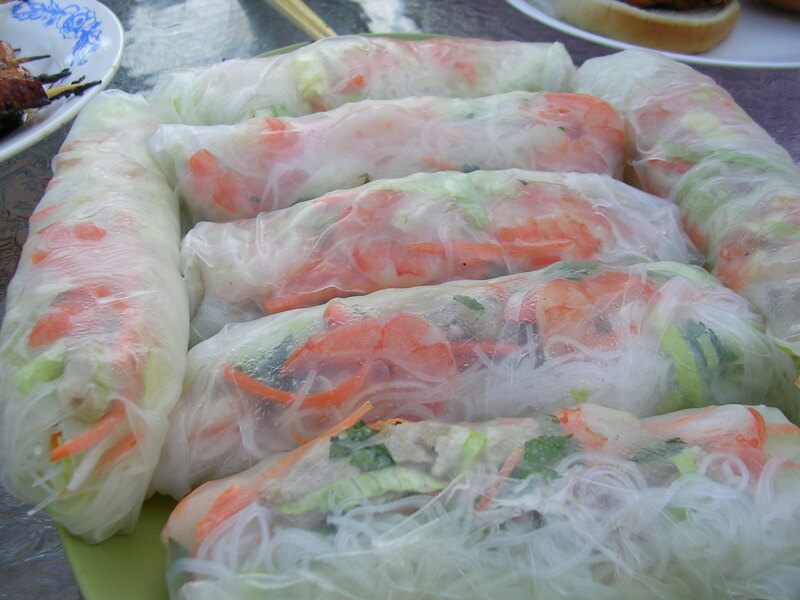 To make the summer roll, take a sheet of the dry rice paper and soak it in cold tap water until it softens up. It should look clear and feel very delicate. Do not use warm or hot water, as it will cause the paper to turn into mush. Next, lay the sheet flat and lay some vermicelli on top. Add lettuce, carrots, onions, cilantro, meat, and shrimp as desired. Roll up the sheet and it will stick to itself when you are tucking the ends together. The sheet will have some flexibility, but be careful not to tear it while folding it up. When you are done, the sheet will look translucent (no longer clear, but not opaque either), but will remain soft. Serve with peanut dipping sauce. For the peanut sauce, mix together smooth or crunchy peanut butter with water until consistency is like a dipping sauce. You may add water or peanut butter as you adjust the texture. Add some hoisin sauce and garlic for flavor. I also added sesame oil but found that it tended to separate out from the sauce, so you can skip that step if you'd like. I hope you enjoyed my little summer bbq menu! :) I grilled all the food myself, it was my first time grilling so I was kind of nervous, but everything came out great and my family really enjoyed the meal. We also had some grilled corn on the cob and watermelon, so trust me when I say that we were stuffed! This entry was posted on Wednesday, August 29th, 2007 at 6:13 pm	and posted in appetizers, cooking, desserts, fruit and nuts, seafood, Uncategorized. You can follow any responses to this entry through the RSS 2.0 feed.